The Aquarium of the Pacific is situated on a majestic five-acre site on Rainbow Harbor. Home to more than 11,000 marine animals, the popular Los Angeles attraction has an award winning architectural style that summons images of rhythmic ocean waves. 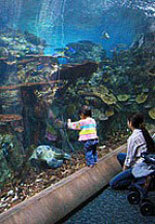 Established in 1998, the Aquarium of the Pacific delights over 1.5 million visitors each year. Featuring 500 species of marine animals, the aquarium displays information about the aquatic ecosystems, habitats and seascapes in the Pacific Ocean. The Southern California and Baja exhibit has two main galleries that enable guests to explore the world located just off the coast of the Golden State, northern Mexico and Catalina Island. The exhibit features sea lions and otters as well as astonishing facts about the migratory movements of whales. The 350,000-gallon Tropical Pacific Exhibit showcases the colorful marine life that inhabits the balmy waters and coral reefs in the western Pacific Ocean. Unique animals on display include live coral, porcupine puffers, zebra sharks and various types of sea dragons. Giant Pacific octopus, jellyfish, auklets, puffins and other animals that reside in the polar region take center stage in the Northern Pacific’s Bering Sea exhibit. The Lorikeet Forest and Shark Lagoon are interactive exhibits that delight visitors of all ages. In the Lorikeet Forest free flight aviary, multi-colored Australian lorikeets alight on visitors who offer nectar, which is their favorite treat. In the aquarium’s 10,000-square-foot Shark Lagoon touch pools, guests can touch bamboo sharks and stingrays as the animals glide by in the shallow water.